Plans to buy a villa in Moravit - Moraira. Look at this section to find the best villas for sale in Moravit. Ask us for more information and Private Sales. If you are thinking of buying a villa for sale in the Moravit-Moraira area, Costa Blanca Dream Home offers you an incredible selection of houses where you can choose the one that best suits your needs. 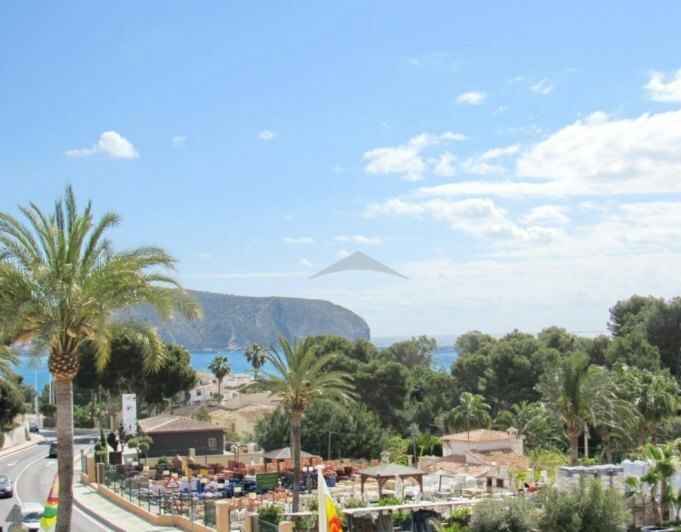 This 1st floor apartment is located withn the area of Moravit, less than a 5 minute walk to the Andragó beach of Moraira and just about 15 minute walk into town. Accomodation comprises 3 bedrooms, 1 bathroom, separate fully equipped kitchen and lounge/dinner room with access to the "L" shape balcony. This property benefits of double glazing through out, off road parking and sea views. This very well maintained villa is in an ideal location very close to all amenities and the beach, only 400m away. The property consists of 5 bedrooms in total and is divided up into separate living accommodation with 2 double bedrooms upstairs and 3 double bedrooms on the ground floor. Both are easily accessed from the road. The living space in both areas is very spacious each with nice living areas and dining rooms. There is ample terracing and the master suite upstairs has a lovely sun drenched patio with a great sea view.The property has been kept in immaculate order throughout with mosquito nets and blinds on all windows, central heating in all rooms plus log burners. Outside there is a kidney shaped pool and ample terracing. The villa has parking for several cars on the drive plus a car port.This villa is ready to move into and would make an ideal family home for 2 generations or for very good rental income. This high quality luxury apartment in Moraira is a must see and consists of a hall with fitted wardrobes, a fully fitted kitchen with a washroom/scullery behind, a big living (with fireplace)/dining room with direct access to the big 30m2 terrace with electrical stores and wonderful sea views, storage cupboards in the hallway, a master bedroom with dressing room and ensuite bathroom (and also access to the terrace), 2 more bedrooms, 1 shower room, 1 guest toilet, and a big storage room downstairs. Behind the 2 private parking spots is also a terrace. Furthermore electric shutters, alarm system, double glazed windows with electric shutters and insect screens, TV connection and airconditioning everywhere, fitted wardrobes in the bedrooms, underfloor heating with electricity or gas or heat pump. 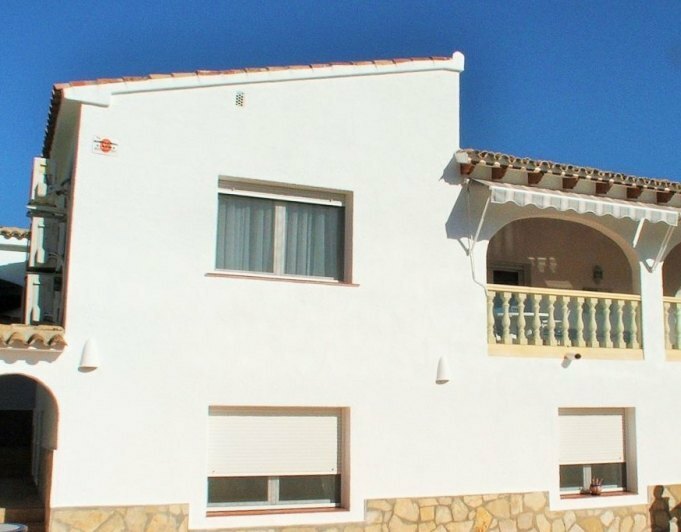 On walking distance of the town center and all the amenities, en in front of Cala l'Andrago. This beautiful modern villa is set on a flat plot within a very good residential area of Moraira, with charming tropical gardens and total privacy. Access into the plot is via an electronic slidning gate with "rust iron" effect wich leads to the paved spacious parking, a paved path leads through the beautiful gardens to the featured sylish entrance door which leads into a bright open plan hall that flows into the open plan living/dining room and open plan kitchen. The living room has a feature stone wall with central fireplace, to the right a hall way take us to the family bathroom and a spacious guest bedroom, a modern flight of stairs leads up to the big master bedroom with office area, dressing room, ensuite bathroom and a big private terrace with plenty of sun winter and summer. From the living room a set of glass doors lead to the ample pool terrace with a private 8 x 4 m rectangular pool with roman steps, plenty of sunbathing area, outdoor bathroom, and Bar/BBQ area. Within a separate building the property also benefits of a totally self contained studio ready to receive guests with spacious double bedroom, bathroom and entrance hall which leads out to a private terrace area.The property is fully decorated with style and features include things like electric awnings with wind sensor and outdoor lounge gazebo with automatic walls and LED lighting, it boasts gas central heating throughout, airconditioning hot/cold throughout, security glazing, mosquito nets, floor to ceiling internal doors and much more. MUST BE SEEN! Villa for Sale in Moraira, Moravit.This villa has wonderful indoor and outdoor space and is located in a perfect position just 15 minutes walk from the centre of Moraira and only a couple of minutes from the rocky beach, bars and restaurants of Algas. Outside there is ample car parking secured by a sliding gate. The main house has 2 ensuite double bedrooms and a master bedroom suite, along with an excpetionally light, bright, open plan lounge/dining room with patio doors onto the covered naya. The well equipped, large American style kitchen also accesses the terrace and pool area, making this perfect for Al fresco dining, especially as there are partial sea views from here.The house is set in a well established garden with mature fruit trees and mediterranean plants, the garden area also provides sheltered seating to escape the heat of the summer sun.An added benefit of this property is the large guest apartment, with an open plan kitchen and lounge area. A good sized double bedroom with ensuite bathroom along with a further double bedroom and large guest bathroom complete this spacious and useful separate apartment.Whilst the villa provides plenty of accomodation there is an option to extend it further if desired by converting the large storage area under the property. A wonderful villa in a perfect location! 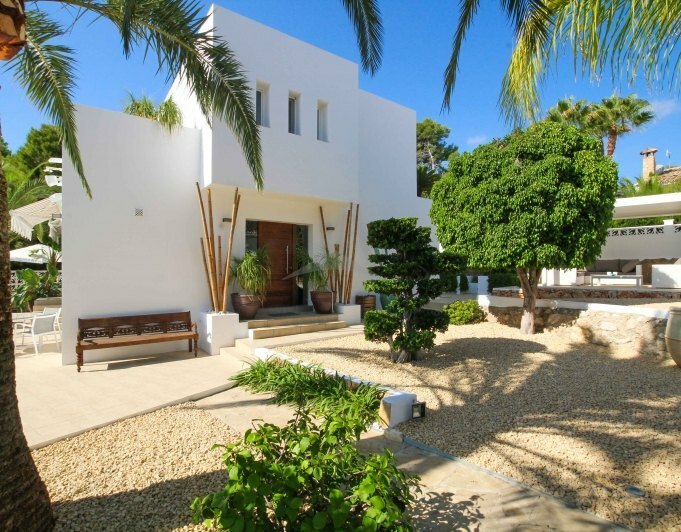 This truly immaculate, pretty villa would make the perfect property for Spanish living. 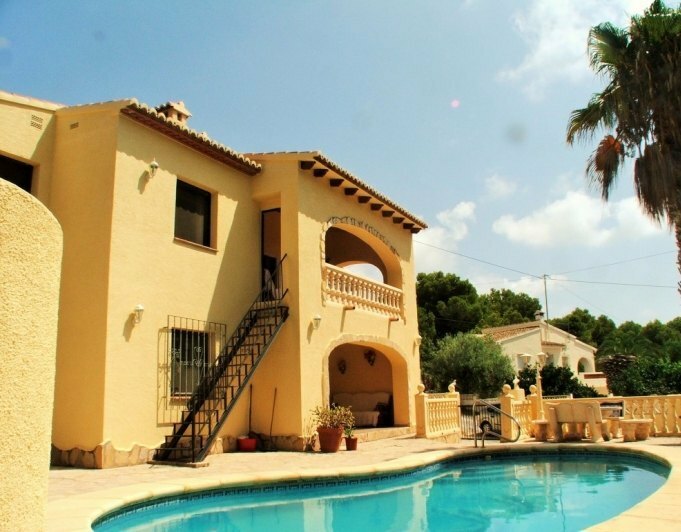 It has 6 bedrooms with a beautiful outdoor pool area and is situated in a very sought after area in Moravit, Moraira, North Costa Blanca.Immediately there is a feeling of tranquility and quality about this villa and going up a few pretty terracotta steps takes us into the main living area which is bright and spacious. There is a large living room and dining area and an archway through to a good sized kitchen. There are patio doors out to a lovely terrace overlooking the pool. Also on this floor there are 3 double bedrooms, the master suite being very spacious and has its own ensuite shower room and has a door out to the terrace and steps down to the pool. There is a guest toilet and guest shower room also on this level.Outside and down a few steps there is further accommodation with a separate 3 double bedroom apartment, again in immaculate condition. The pool area is beautiful with a large outdoor kitchen and the gardens are easily maintained and very attractive. 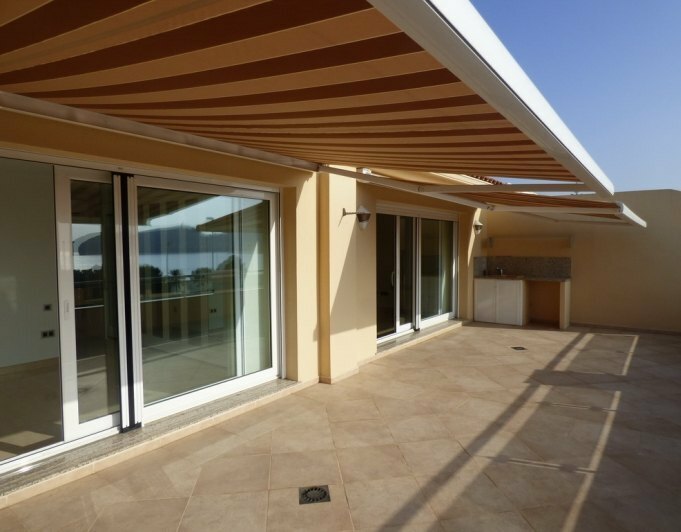 There is a detached garage plus a secure parking area inside the plot.The villa has gas central heating, airconditioning, double glazed windows and doors and mosquito nets. 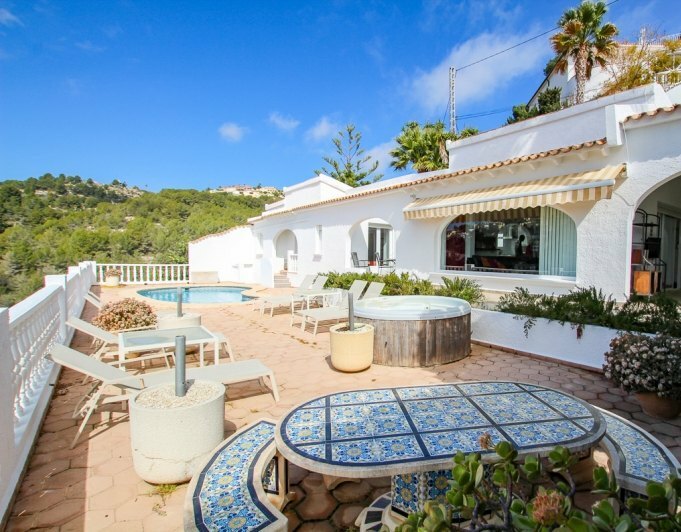 The villa is ready to move into and would make a lucrative rental business or for family lifestyle being situated walking distance from the main town of Moraira and very close to shops, restaurants and the beach. Whether in Summer or Winter, your family will be able to enjoy the magnificent Moraira weather and their own swimming pool in the villa of their dreams. We have unbeatable villas in Moravit in exclusive urbanisations where you can enjoy your villa close to all the services that Moraira offers you. In the Moravit area of Moraira you will find different villas for sale with different characteristics, where you will surely find the best villa that best suits your needs. Most of the villas for sale that Moravit offers are built with top quality materials and with perfect finishes. They also have large windows in the rooms that allow sunlight to enter, creating a cosy, Mediterranean atmosphere throughout the house. We can also highlight the extraordinary gardens surrounding the villas, usually created with native vegetation, pines and leafy branches that produce very pleasant shadows in the middle of summer when the heat is more suffocating. But the best of all and that you will be able to enjoy in any of our villas for sale in Moravit are the incredible private swimming pools that accompany our houses, and that will delight your family in the hot summer days. Moravit area is a few minutes driving to Moraira center where you can find a lot of restaurants and services. The Moravit beach is popular for snorkelling with ideal bars to get drinks and food. The best of this area is you can buy a villa with best prices and conditions than other similar areas. Find your dream villa in Moravit for sale and ask us for more information to see other private villas. Also we have other villas for sale in: Pla del Mar, Moraira and El Portet area.